1. CLEANSE AND MOISTURISE – EVERY NIGHT! Whether it’s a day in the city or a day in Ibiza; the pollution of the city, the dehydration and exposure to ageing rays of the sun, the salty air, layers of suntan cream and dusty / dirty roads will affect the condition of your skin. So it’s important to get that all off at the end of the night. EVERY NIGHT! If you don’t it will all remain on your skin, rub down into your pores AND rub off onto your lovely pillows too. A good nightly cleanse is so much more important than a morning ritual because our skin repairs when we sleep. DON’T cleanse your face with shower gel… PLEASE……get a good cleanser that is right for your skin or it can make it even more oily / dry. And always cleanse with a flannel or mitt so that you gently exfoliate at the same time. – combination / oily skin: choose one with rosemary, lavender, jojoba or tea tree – something balancing and calming. – dry skin: needs a gentle cleanser that hydrates so one with rose and camomile is great. – sensitive skins: can look for calendula, which is soothing and healing. Top Tip: Think about how your skin feels after cleansing – if your skin feels TIGHT it is a sign that the cleanser you are using is too astringent and can strip the skin of its natural sebum (oil) on the epidermis. Seems obvious I know but do you really eat enough? Whatever you eat in your diet I can guarantee you that eating MORE dark leafy greens will give amazing results to your skin AND give you more energy. Look for seasonal greens at local farmers markets for the freshest, most vitamin packed fare. Broccoli, Kale and Spinach all are liver boosters which boosts the brightness of your skin too. Needless to say… organic and locally sourced is THE way. 3. COFFEE OR WATER & LEMON? Hmmmm? I know, you hear it all the time. We all bang on about it. But I can truly say with conviction that starting your day with a hot water and lemon will be AMAZING for your skin. It alkalises the body (whilst coffee makes it acidic – ouch! Acid reflux) and helps to cleanse the system of any toxin build up whilst rehydrating your organs – including your skin – the biggest organ of all. Remember: toxins means dull skin – fact. 4. LIE BACK AND THINK OF YOUR WRINKLES!! Yes, going to sleep on your back really works – trust me I’m 50! Rest your head sideways, on your hand, I mean really rest it heavily as you would on a pillow and look at it in the mirror……see what I mean? Now imagine doing that for 8 hours a night, every night. If you practice lying on your back while you sleep you allow all the tiny facial muscles to relax naturally PLUS you will reduce the wrinkles in your décolletage too. Double bonus time! It is a proven fact that a more positive attitude to life produces and more positive life. Take it from me I’ve been on the opposite side of this philosophy! So watch those negative thoughts because they produce stress and we all know where stress can take us. Meditation calms the mind and reduces stress. FACT. Reduced stress in your life reduces wrinkles. FACT. Learning to focus on the present moment that is your breath (rather than worrying about your future or dwelling on the past) is a powerful tool to combat stress and anxiety. This is why my HEALING FACIALS really work like no other facial you have ever had before. Guiding you through a relaxing meditative visualisation at the start of my treatment stimulates your mind and body to go into a floating state of relaxation. This allows all the tiny muscles in your face to soften and release any tension….so you’re half way there even before I’ve started the whole gorgeous facial. 7. INVEST IN REGULAR ME TIME! I know, I know, you don’t have time. But just as with meditation, it is so important to take time out for yourself as a priority in your busy schedule. Many people merely wait for their once a year yoga and wellness retreat or holiday – and this can be a great “reset” – yet to keep glowing all year around, schedule in “me-time!” as often as possible and feel the benefits of the extra energy zings! I know this all may sound like a lot but little by little on a daily basis will bring huge benefits to your well-being. 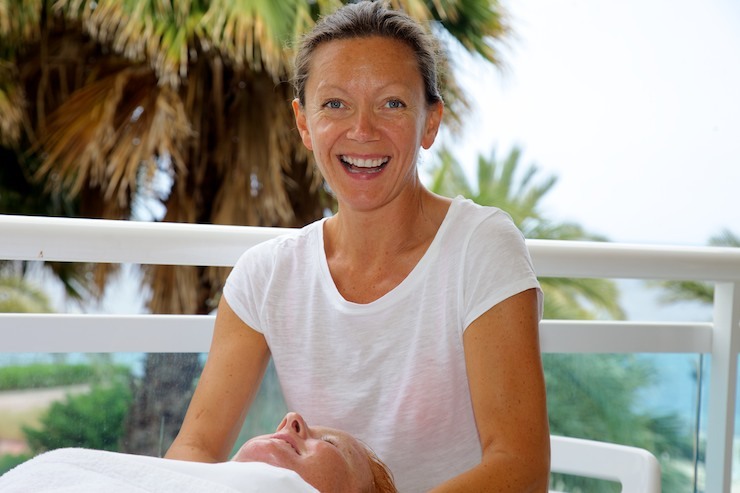 Contact Ibiza Retreats to book a healing holistic HEAVEN facial with me (see below) I’m really looking forward to meeting you. Want to experience Marion’s healing hands and an LIA therapy facial? It gives you an indulgent, 30 minute massage of the shoulders, neck, face and head; releasing tension, and stimulating those oh so important blood and lymphatic systems for a plump and lustrous looking glow….from the inside out, luxurious all natural products for sloughing off dead skin and improving circulation with peelings followed by a zinging bee-venom face mask to incite natural collagen production. Visit her website www.marionstone.com for further information or email info@ibizaretreats.com for a special autumn offer! Do you often “buy organic” because you want the most nutritious, ecologically sound and, quite honestly tasty and delicious produce? Yes – organic is definitely better for your health – and vital for the health of our beloved planet, however, the best for your system and our eco-system, as well as being the most nutritious, is organic produce that is locally sourced… and also in season, rather than being flown in from thousands of miles away. Health organisations around the world concur that this is the best way to maximise your intake of vitamins and minerals. And whether you are eating a fresh apple in England or Germany, Tomatoes off the vine in Italy, or a cold slice of fresh Ibizan watermelon in summertime, s well juicing you up with an all-natural taste-sensation, doesn’t it make you feel instantly more alive? Create harmony within your body and with the environment around you through honouring the ebb and flow of nature’s abundant offerings season by season. * Save on carbon output and noise pollution from planes and save the oil and petrol fuelling the trucks that carry produce across the world. * Invigorate the local economy and inspire local farmers to grow healthy produce without the use of toxic chemicals whilst minimising the use of preservatives that aid longer shelf life. 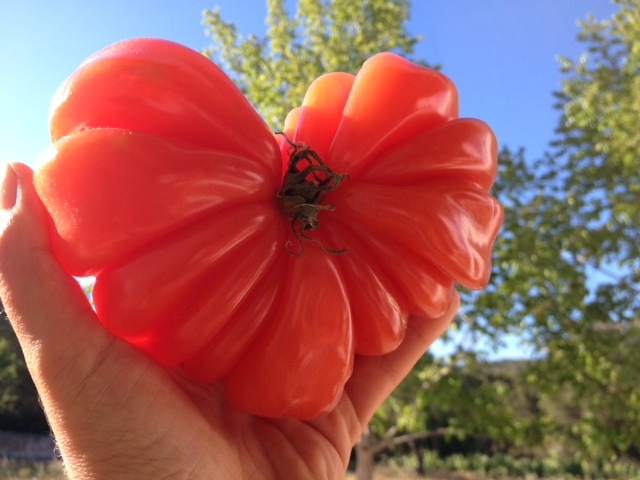 * Encourage more love and respect for your countryside by appreciating the seasonal produce that magically appears, from heart-shaped tomatoes to the August-September flush of grapes, figs, almonds and persimmons, Ibiza is juicy and abundant… what fresh fare is local to you now? * Nourish your system by ingesting food that has come directly from vine and field to table that is as full as possible of vitamins and minerals, supporting organ function and energy requirements by eating what is in season. * Create awareness and spread the EAT LOCAL consciousness amongst family, friends as you glow with more health and energy! We are ever-more inspired by the expanding network of healthy organic restaurants and cafes around Ibiza! Amongst many… wonderful places for meetings too… we are passionate about Passion cafes from Ibiza town, to Playa D’en Bossa, Santa Eulalia to BFit (thank you Lana Love for sewing more seeds of love – literally!) – La Paloma cafe and restaurant in San Lorenzo have a permanent place in our hearts (and what an amazing “final lunch” for retreat-guests to gather and feed before they enter the retreats), ditto for celebratory suppers! – whilst Wild Beets in Santa Gertrudis has shaken up our palates with new raw sensations and when in Benirras…. we simply head for the SeJuiced bar after our morning swims and early evening snorkels for meditational communions with the fishes.. San Joan village is home to the sophisticated Spanish organic cuisine at the higher-end Giri cafe or take a quick-healthy fix trip down The Rabbit Hole in San Rafael. We get our glow on with daily juices and smoothies! Do you find you pushing yourself within your yoga practice? Or criticising yourself when you are not “up in time” to strengthen, stretch and breath before jumping in the shower and heading to work? Many of us have been cultured to and conditioned to believe that pushing ourselves beyond our limits is a GOOD thing: that this performance-based practice is what will enable us to “succeed”. Yet yoga is not about becoming that perfect figure of 8 physically. Hatha yoga – “Ha” = sun and “Tha” = moon. Yoga is an art and a tool-kit for reunifying body, mind and spirit, to live healthily and in harmony, by reawakening your body’s intelligence so you can stay in balance physically and emotionally, by balancing the male, solar “action” energy with the female, lunar “receiving and letting go”. So for all you amazing, powerful yogis, retreaters and life-travellers out there… we invite you to ask yourself honestly: “how often am I pushing myself to keep going beyond what really feels good”? How often am I trying to prove that “I can” when my body has been saying no? 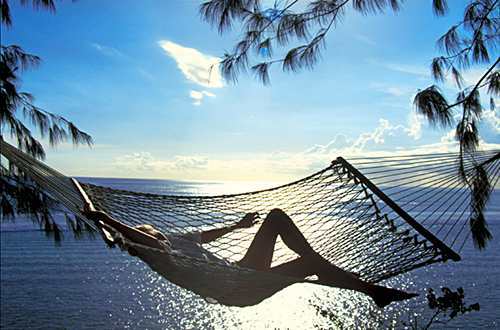 Do I have the discipline to “rest and receive” when my body truly needs this? As this is the secret, lovely readers, to health, happiness and longevity (and isn’t that really what success is all about?). Yoga is a magnifying glass for clarifying areas of imbalance, of pain or tightness and discomfort – as well as a medicine for self-knowledge and healing. It highlights blockages and, with breath work and a mindful, meditative yoga practice, you can learn to release the tightness. You can allow your body to soothe the pain and heal the discomfort holistically by releasing the blockages when your body – mind – and often soul… are ready. And to do so, requires gentleness. To gently “allow” the release, with the breath, to happen when your body and soul are truly ready. The paradox is that “letting go” cannot be done with the mind. The more you focus your thoughts and attention on what you want to let go of, the more fixed in your system it becomes. So this is why the breath is the key, to release. By focussing the mind on the breath, a space is created, the thoughts slow down and, with practice, can even cease. By breathing into the parts of the body that feel tight, tired or tense with intention, you are creating space around the muscles, the tightness, the tension. You can empower this release with gentleness, by creating a “Sankalpa” or healing intention. Thoughts become things… the cells within your body and their components and are dynamic, so you can visualise the healing or releasing to empower your intention. Every cell in your body is a conscious organism doing everything possible to enhance your wellbeing. Metabolic healing, which reharmonises your body, is based on enzyme activity and these enzymes are directly influenced by your intentions or thoughts. If you are over-riding your inner-signals that tell you when you are physically tired, the adrenalin that circulates starts to knock out the para-sympathetic nervous system, which is what enables the body to truly and totally rest. So how can you rest into a daily practice that enables you to live a happy, healthy, harmonious life, so here are 5 steps for letting go…. with gentleness. * Make sure your daily practice feels realistic, so that rather than feeling you are failing when you do not do it, you can choose times of day that complement your lifestyle. 5 – 10 minutes every morning is much more beneficial than 1.5 hours once a week. * Ask yourself each day by placing your hands on your body and feeling your whole self – how am I feeling? in Body? In Mind? In Spirit? How is my energy? * Set your “Sankalpa” (Sanscrit for “intention”) for the benefits you wish to receive i.e. : balance, calm, feeling centred and grounded, energised, uplifted. The difference between a true Sankalpa and a mind-let goal is that a Sankalpa is NOT sent from the “misguiding” ego, senses or conditioning (what you think you OUGHT to be feeling). It comes from your inner-truth and, therefore is in alignment with your highest good and holistic wellbeing and that of the world around you. If you keep intending “energy” when your body is actually full of nervous energy because you haven’t stopped for a week, then actually what you need may be “peace and release”. * Listen and feel into your body’s feedback when you set your Sankalpa… and sculpt your practice to suit YOUR rhythm just for today – ask yourself, how long and at what intensity will be of greatest benefit to me? We have a very simple question that we like to ask ourselves at Ibiza Retreats: is it a pleasure or a pressure? We answer this questions by feeling into ourselves…. does it feel good, right, compelling? or is our breath shortening, chest tightening? We invite you to get to know your physical reactions and responses to be able to listen to your body, to be gentle with yourselves and to en JOY living in greater health and harmony. July 10 – 13 offers men the chance to dive into the deeper life questions, with a like-minded circle of men of many ages, backgrounds and nationalities. Do you think you have achieved “everything” you set out to do…. yet are wondering why you are still not feeling completely fulfilled? Do you have enough time for your family, your friends; time to be alone or for enjoying and appreciating all that you are creating? Despite running after all of life’s opportunities as fast as you can to win and create and support your home and family, do you ever wonder … is there something more? The Quo Vadis question is this: WHY RUSH? and WHERE EXACTLY ARE YOU HEADING? And… What is YOUR DESTINY? For millennia, men have taken time apart from their tribes and communities to explore these questions. Following this tradition, you can explore and inquire into your inner-worlds in a supported space and amidst a strong circle of men, coming together to share, to network and to inspire each other. And, with deep transformational work, coaching, shamanic ceremonies and initiation rituals, systemic constellations (Hellinger), live music events, meditations in nature wilderness, adventures and beach trips, Sudhir, Ramateertha & the “Men’s Liberation Team” offer you the time and space to slow down and explore these vital life questions.. in the magical natural landscapes of Ibiza, that create backdrops and horizons for this essential self-reflection. Liberate yourself from the fast-stream: come and enjoy the flow-of-life stream. Sudhir and his VISION: Since about 25 years ago I have been leading seminars for men in Europe, Asia and US and I truly love the honesty and intensity that arises when men get together in the spirit of true brotherhood. Something very powerful and healing happens when men drop their usual masks, games or defenses and meet as friends with an open heart. Held high up in the magical, mountain-top retreat of Buddha House Ibiza, this is the second year that the retreat is running, Ibiza is breathing a big, embracing, sigh of relief that men can also share time and space to speak from the heart and be fully heard. Delicious cuisine accompanies the retreat and indoor and outdoor sleeping options offer you to the chance to get back in touch with nature… including a mongolian yurt and teepee…Are you feeling the call? Contact us for further information and to reserve a place.